A Warwickshire entrepreneur, who grew up wanting to ‘design trainers for Nike’, is growing his own cool design and manufacturing studio in Coventry after receiving business support. Adam Duffy, who grew up in Claverdon and lives in Rugby, has been working in the fashion industry for 15 years, including for a range of high street brands. 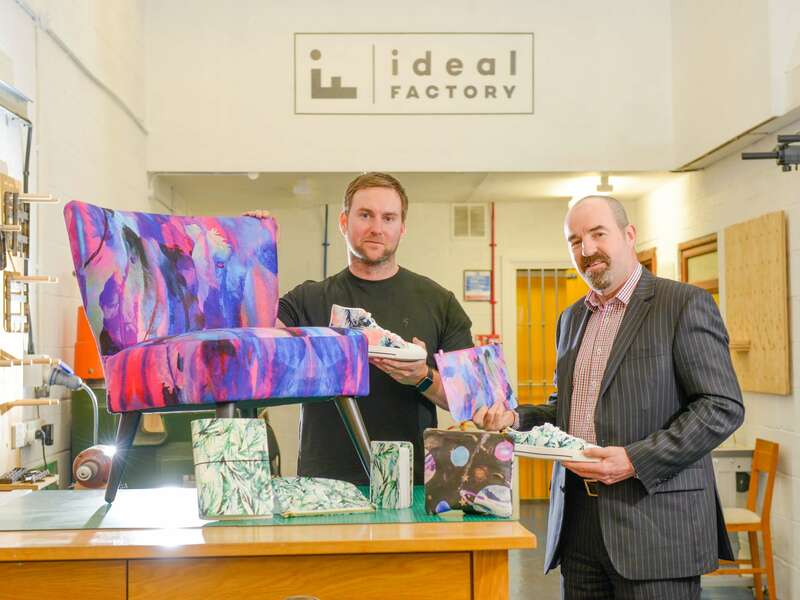 He launched his business, IdealFactory, in 2016 to offer designers and artists the opportunity to have their work turned into chic fashion or furniture products – from trainers to chairs. The company already employs four staff from its studio at the Bilton Industrial Estate in Coventry but now has ambitions to grow significantly after receiving support from the University of Warwick Science Park’s Business Ready programme. Adam was assigned a mentor, Paul Walker, from the programme, and he helped the company develop a marketing plan and has also offered general business advice, acting as a sounding board for new ideas. IdealFactory has grown by 80% on the back of the support from Business Ready, Adam has his eyes on significant growth by adding more staff to the team and attracting more designers and artists to use the platform. He said that Coventry winning UK City of Culture 2021 was a perfect springboard for the artistic and creative sector in the city. Adam said: “When we were first getting started I decided to look for what support was available. I spoke to the CWLEP Growth Hub and they referred me on to Business Ready. “The support has been brilliant. We are a small business and, as the owner, you sometimes want to be able to bounce ideas off someone – having a mentor to be able to speak to who has experience in business was really helpful. “We’re confident now that we have the right platform and the right offer to attract more designers and artists to create their own products using the platform which, in turn, will increasingly draw in more customers for those products. “We also have software that can turn a design into a style of art. So you could upload a photo and, using machine learning, it could for example turn it into a Mona Lisa style design. It’s merging art, design, technology and manufacturing and it’s already interesting some major brands. Ian McFarlane-Toms, a Business Growth Adviser at the University of Warwick Science Park, said: “Being the owner of a small business can be a lonely place, so having the support and guidance of a mentor can be extremely beneficial. Sometimes it can be to confirm that an idea you have is a good one, or to encourage them to look at it a different way.